I have developed new ways to free up joints. Here is the story of my discoveries, and what those discoveries can mean for you. What jumped out at me was where the joint capsule attached to the thighbone, not right at the joint line but up to two inches out along the femur, at the far end of the femoral neck. 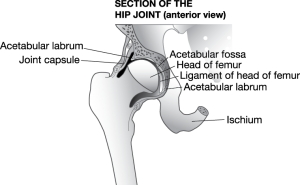 I could see how with every movement of the hip there would be glide of joint capsule over a lot of thighbone. But any place where two things in the body glide over each other, there is also the possibility for them to stick together if that area gets inflamed forming an adhesion. I started to examine my client’s hips to see if I could feel hip joint capsule adhesion. To my surprise all of my clients had some degree of hip joint capsule adhesion ranging from a little to a lot. My next project was to figure out how to release these adhesions, restoring full motion in the hip joint. My early attempts were predictably effortful and in hindsight clumsy, but I did succeed in releasing the joint capsule adhesions, giving hip joints greater range of motion and greater ease within range of motion. The improvement was immediate and often profound. My next question was how much capsule other joints had over adjacent bone, and if they too had such adhesions. Looking into the anatomy I saw that all joints have capsule over adjacent bone, just less far than the hip joint. 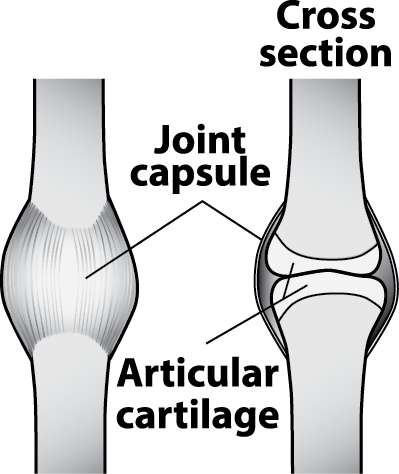 How far the capsule extended over bone was related to the size of the joint and to range of motion. The bigger the joint the farther the capsule tended to extend over bone. 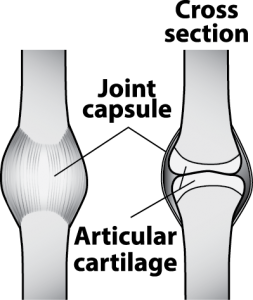 The larger the range of motion a joint has the farther the capsule extended, so the knee joint which is a large joint with a large range of motion had a longer run of capsule over bone, and joints in the palm of the hand which are small and with a limited range of motion had much less capsule over bone. Testing many other joints in my clients bodies I found that joint capsule adhesions are quite common. To my surprise most joints had some level of capsular adhesion, often a little bit, sometimes a lot. Freeing these adhesions made immediate increase in range and ease of motion. 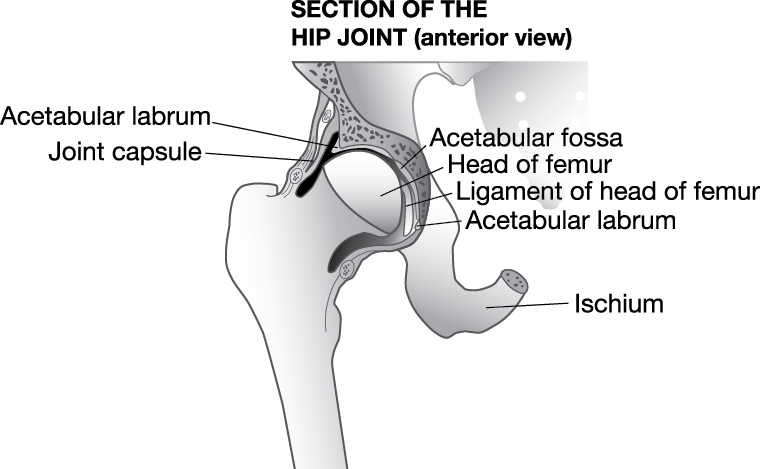 Here is a generalized picture of a joint showing capsule over bone. This picture is most like a finger joint. 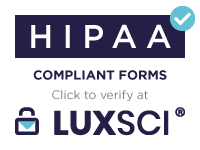 I was eager to share what I was learning with my colleagues, but decided to wait until I had both more verification of what I was feeling, and until I had developed better technique for both assessment and treatment. Next I arranged for some dissection time in one of the few cadaver labs with non-preserved human cadavers. The first hip joint I opened had a big stripe of adhesion up one side of the joint sticking the capsule to the whole length of the neck of the femur. On a foot with a well developed bunion I opened a joint at the base of the big toe. Not only was the capsule stuck to most of the bone it should have glided on, the capsule was also glued to part of the white articular cartilage. And so it went, every joint I opened had some amount of capsular adhesion. Trying the treatment techniques I had developed on these cadavers I could see the release of the adhesions, and demonstrate increased range and ease of motion. Rules in all cadaver labs in the present era forbid photography of any part of a cadaver. For the future I plan similar dissections of animals to be able to document these adhesions, and the changes created by treatment with both still photography and video. Continuing to develop assessment methods, I found ways to examine joint capsules from several perspectives. Comparing information from these several methods I could map and characterize the adhesions to a fine scale, about 1mm. Bursae are in mechanically high stress areas of the body so frequently become inflamed. As the body grows new fiber to repair the walls of inflamed bursae often some of the fiber grows through the gel to the other side of the bursa. 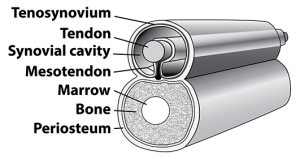 With such ingrowth of fiber a bursa can no longer roll between the tendon and bone, or other pair of structures it is protecting from each other during movement. It is good that the bursa is still between the two structures so they do not rub on each other, but when adhered in this way the bursa resists glide instead of facilitating glide, thus stiffening the area. When a bursa is adhered in this way, it can be centered, or it can be rolled to one side. If it is rolled to one side it now holds a misalignment in place. For example if the bursa between the upper part of the patellar tendon and the end of the thigh bone is rolled to one side and stuck together this adhesion makes the knee stiffer and being adhered off center it makes the knee cap track improperly. The wall of a bursa can also be pleated and stuck to itself puckering the bursa. These pleats can be precisely located, characterized and then released. With small modifications the same assessment and treatment methods effective for restoring joint capsules are used to restore bursa glide. One of the challenges of developing these new methods for assessing and freeing bursae is that bursae are under-represented in anatomy texts. I had to look at many sources to find them all. It was worth the search, each one was a revelation for how the mechanics of the body can be distorted, and how it can be restored. The gel lubricant inside both joint capsules and bursas is called synovial fluid. Syn – ovial in latin literally means ‘with egg-like (stuff)’. Synovial fluid has the appearance of egg yolk, and the fluidity of egg yolk. Joint capsules and bursae are both classified as Synovia. They both contain synovial fluid, and are made of synovial membrane. There is a third group of synovial membranes in the body; sheaths around portions of some, but not all tendons. These synovial fluid containing tubular membranes are called tenosynovia. Like joint capsules and bursas the synovial sheathes of portions of some tendons can become inflamed and then heal stuck together, limiting the glide of tendons. This reduces flexibility and makes the muscles have to work harder to do their job, contributing to muscle overuse syndromes. Below is an illustration of a tenosynovium. Together, these two types of relationships of tendons to surrounding tissue offer more complexity than joints or bursas. Not only are there two very different types of tendon glide relationships, the transition between them presents special problems. Also, inside each tenosynovim there is a natural tethering unlike anything in a joint capsule or bursa. I have adapted the methods originally developed to assess and treat joint capsule fibrosities to assess and treat all the various relationships of tendons to their surroundings, again often with marked improvement in range of motion, ease of movement and alignment. Most treatment sessions with my clients now include some work on synovial membranes. For clients, these new methods to assess and treat joints, bursas and tendon sheaths mean freer and easier movement with more comfort. Treatment tends to be more efficient and complete. Now in 2016 the assessment and treatment methods I have been developing are sufficiently developed to share with colleagues. If you are a practitioner learning these groundbreaking new methods can boost your success in achieving your client’s goals of freer more comfortable joints. For information about these classes including prerequisite click here.